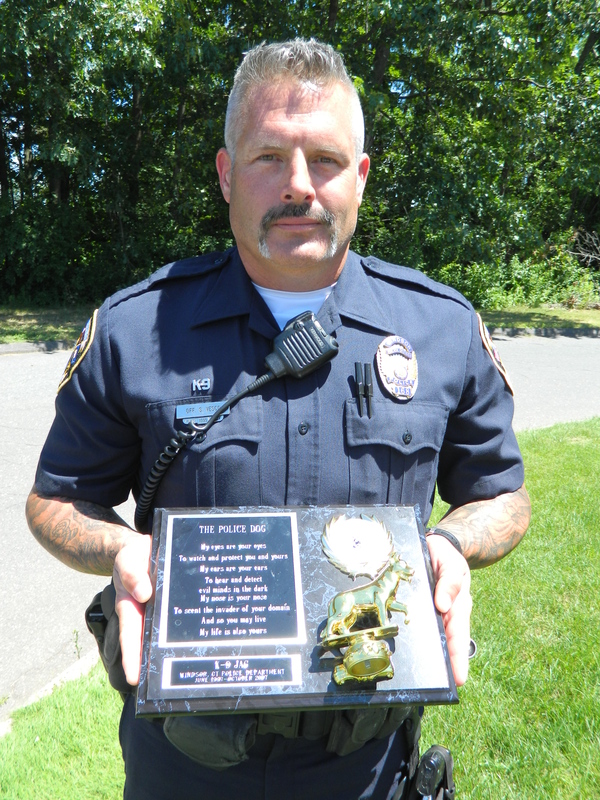 Officer Steve Vesco and his K-9 partner, Iko, brought a 1st place trophy and medallion home to the Windsor, Connecticut police department. 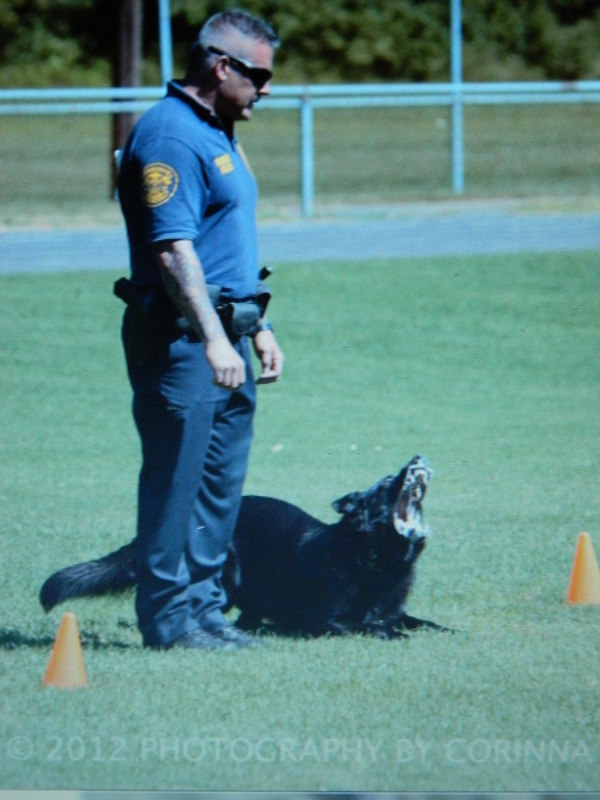 The K-9 team won the award at the 2012 United States Police Canine Association Region #4 K9 Field Trials. “He did well,” Vesco said of Iko during a June 27 interview at the Public Safety Complex in Windsor. Iko is a 4-year-old solid black, male, German Shephard. The USPCA event was held June 23-24 in Middleton, Massachusetts. With temperatures in the 90s on day one, some of the canines could not handle the heat and four teams dropped out, leaving a field of 26 competing teams. Day two weather conditions were also tough, morning rain gave way to more heat and humidity in the afternoon. Nonetheless, Iko maintained his focus and attention to the tasks at hand which was noticed by the judges, according to Vesco. The pair took 1st place in the “Team Division” in which their scores were combined with three other pairs including, Sgt. Don Evans of the Essex County Sheriff’s Department in Mass., Offr. Tom Nicholas- Amesbury, Mass., and Offr. 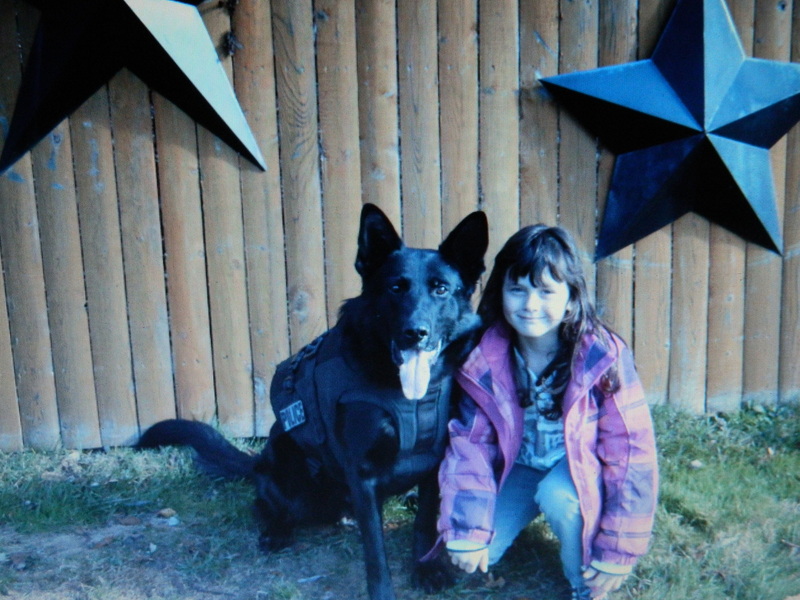 Joe Ryan- Manchester, New Hampshire and their K-9 partners. The teams were judged on obedience, agility (that entailed mastering five different apparatus), a six box suspect search, suspect apprehension with and without gunfire and evidence recovery. In the latter activity the canines had three minutes to recover a shotgun shell and screwdriver within a 40 foot x 40 foot square of grass. “We did it within a minute and 30 seconds,” said Vesco. 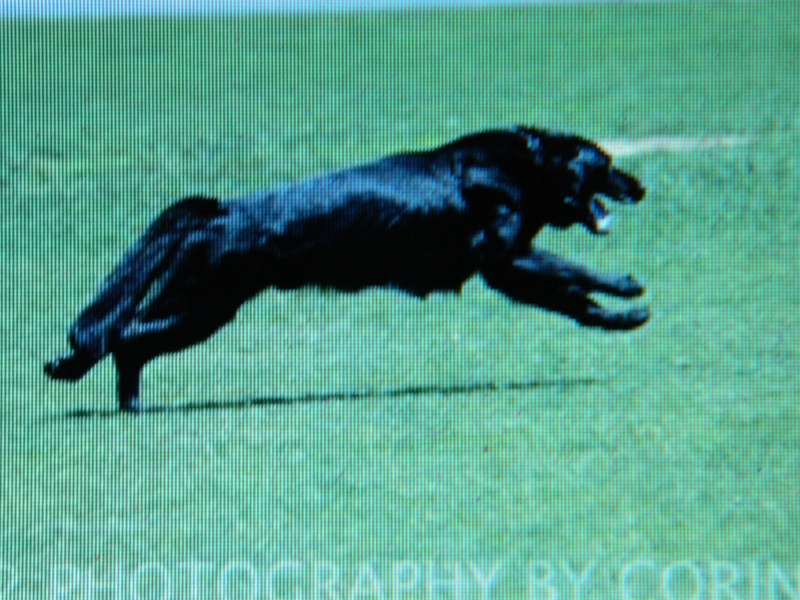 Courtesy photo by Corrina Cole – 2012 USPCA Region #4 K9 Field Trials. 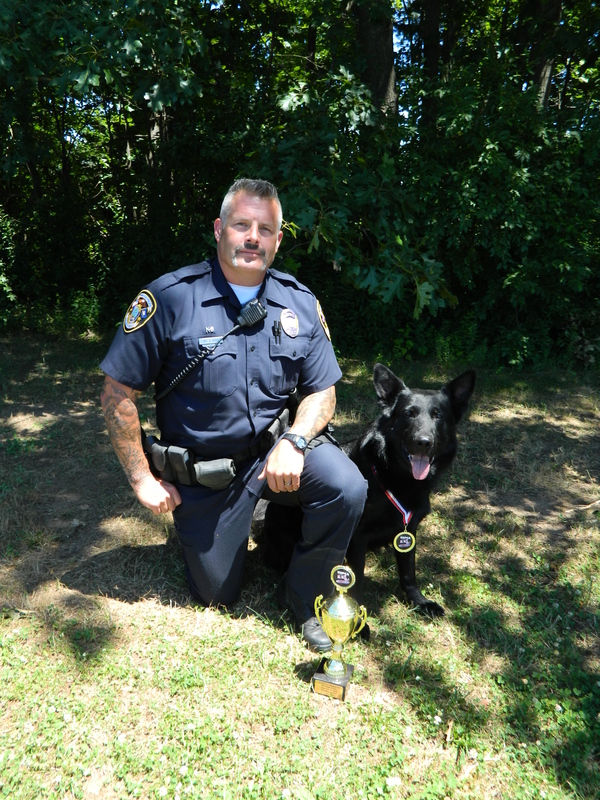 No stranger to victory in police K-9 competitions, Vesco has won numerous trophies throughout his law enforcement career. 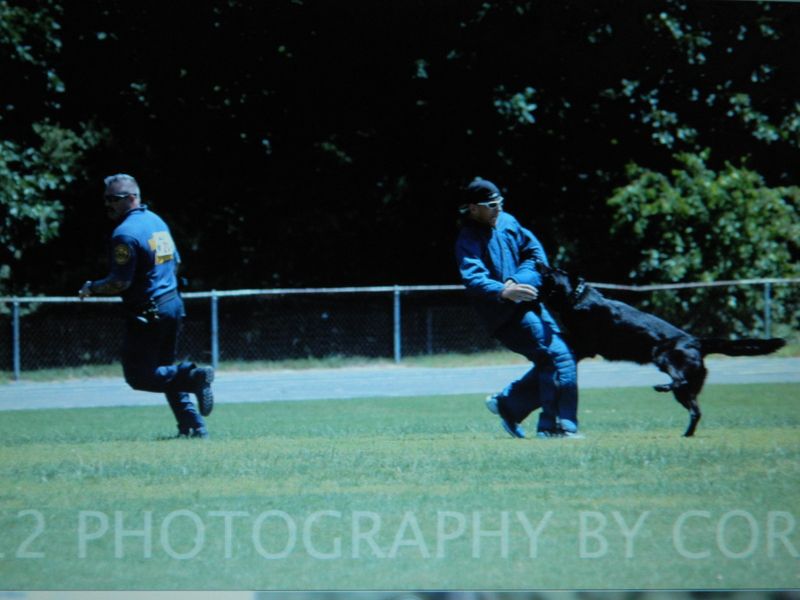 Even so, he stills trains with Iko daily and relies on training advice from fellow K-9 handlers Offr. Joel Wun and Sgt. Pete Signorelli of the Ludlow, Mass. Sheriff’s Dept. “It’s another set of eyes. You can’t see yourself and there are so many ways to train dogs. I’m open to learning,” Vesco said. Thanks to his experience, Vesco said he is less stressed than he used to be when competing and is cognizant that the canines sense competition days are different so just like people that can affect their mood and demeanor. As well as his technical ability, Iko is a “great street dog” Vesco said. That means he is good with the public, friendly and sociable. “And, he is great at home,” added Vesco. Winning is nice says Vesco but awards represent more than just a prize. They translate into reinforcing a police canine’s credibility on the job, he pointed out. For Vesco his success goes beyong professional accomplishment. It is a source of tremendous pride to his family. His 7-year-old daughter Sadie enjoys bringing his trophies to school for show-and-tell. 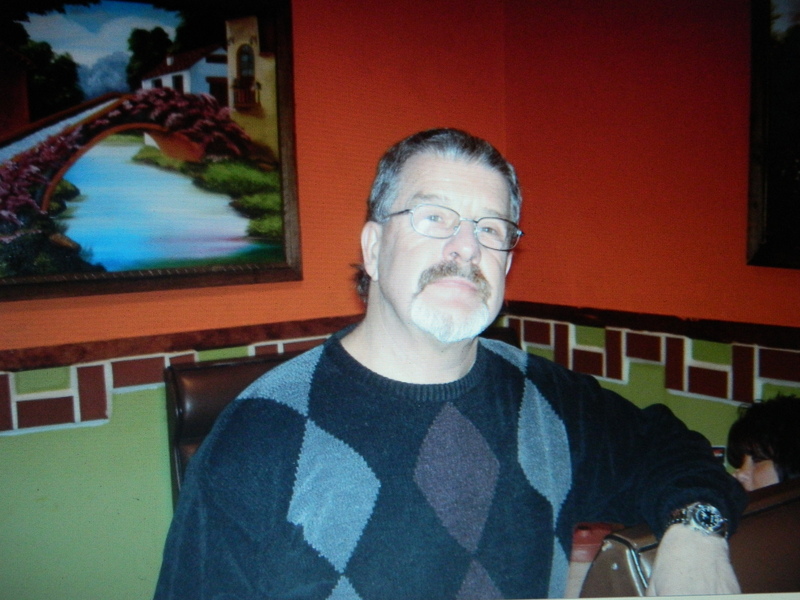 Vesco’s father David, a retired reading consultant, travels from his New Hampshire home to attend the various competitions and attended the one in Middleton. Courtesy photo – Officer Steve Vesco’s father and “number one fan,” Dave Vesco. “My dad is my number one fan,” Vesco said. Photo by Jacqueline Bennett Officer Steve Vesco displays the plague presented by the USPCA in memory of his deceased partner, Jag. Vesco was also honored with a plague presented by the USPCA in memory of the beloved Jag, his deceased K-9 partner. As Vesco’s partner, for many years Jag served the Windsor community and central Connecticut as part of the regional SWAT team until his retirement. Not content to rest on his laurels, Vesco is thinking ahead to the 2013 USPCA competition. Based on the positive feedback he said he received about Iko at the recent competition, Vesco is certain they can do even better. He was not completely satisfied with Iko’s performance in agility and is confident the canine can improve. Vesco said he has his sights set on “Overall Best Team.” He and Wun are already developing training strategies. “There is always room to improve. We have a full year to train,” said Vesco.